The ultimate guide to Arosa ski holidays in 2019 & 2020. Even before you get here, the train ride up the mountain is nothing short of spectacular. Once you do reach the resort, tree-lined streets, alpine lakes and hundreds of summits form the landscape. Then for the skiing: Arosa-Lenzerheide is one of Switzerland’s biggest ski areas, with snow sure pistes and terrain so good they hold World Championships here. All in all, you’re in for a treat with Arosa, which is why we’re surprised that Brits don’t ski here more. 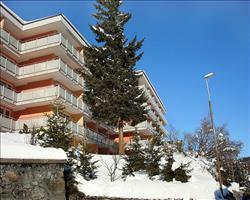 Arosa is high in the German-speaking canton of Graubünden, where you’ll also find the resorts of Davos and Klosters. The transfer from Zurich is doable by coach or rail: opt for the latter at least once as it includes the famous mountain train from Chur. It’s the last leg of the journey when you’ll want to avoid dozing off– there are some magnificent views over the Schanfigg Valley. The town has the Obersee and Untersee lakes on each side, surrounded by that rugged mountain scenery we all hold dear in Switzerland. Hopefully the lift company are still doing early morning trips on the Weisshorn cable – the sunrise over the Mattertal is well worth getting out of bed for. With trees lining the streets and no through traffic, it’s the refreshingly remote feel we really love about this place. Turns out we’re not the first ones to think a break here does you a world of good – people have been visiting Arosa as an Alpine health resort since the Victorian era. You can get around town by bus or horse-drawn sleigh ride (we know which we prefer…). Inner-Arosa is the older and prettier sector, with historic buildings like the 15th century chapel that peers over Untersee. Most restaurants, shops and accommodation are housed in newer builds at the Obersee end, as well as the two main ski lifts. 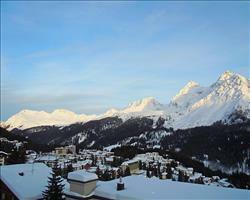 View our detailed Arosa snow forecast or snow report and see all live webcams, piste maps, road and travel maps and lift pass prices. For a picture of historic snow conditions see the snow depths month by month with our Arosa snow history. The local slopes are just right for learning on, with a kid’s area at Inner Arosa for the youngest beginners. The Arosa Junior Club works with the Swiss Ski & Snowboard School to provide private and group tuition and there are plenty of long, easy-going blues to enjoy. A great run for a confidence boost is the Brüggerhorn Prätschli, which looks over the Obersee and one to aim for by the end of the week is the epic Hintere from the Hörnliexpress top station to lake level in the town. There’s a lot of potential for intermediates who can roam around on wide, cruisey pistes. We like the Carmenna but before you ski it, stop and soak up the Weisshorn’s unbeatable view of literally hundreds of peaks. Intermediates can ski over to Lenzerheide on a network of reds– the Totälpli from the Rothorn summit (2865m) is an absolute must ski for that top-of-the-world feeling. While the black pistes are in quite short supply, they link up to some fantastic reds. The Diamond Slope from Brüggerhorn goes into a red and then a blue for an increasingly easy descent back towards the town. Where the area really shines for experts is off piste: There are some terrific marked but ungroomed trails (numbers 41, 53, 69 and 71 on the map) and the Weisshorn and Rothorn have some seriously good freeriding terrain. Head to the Carmenna Pass and glide down to the legendary Carmenna Hütte for a rewarding dose of their notorious Munggapfupf – a nutty shot with a well-deserved topping of cream. With the snowpark served by the Tomeli lift and another over in Lenzerheide, freestylers could shred here until the cows come home. The area’s also known for its halfpipe and ski cross course – both hosts of the World Championships. If you prefer to pass the time on thinner skis, there are 32km of cross-country trails with everything from short excursions to committed descents. For lunch, try the hearty goulash or macaroni on the panoramic terrace at the Hörnli Hütte at the very top of the Hörnli lift. It’s always worth paying a visit to the Maran cheese dairy to watch how the local Alpine cheese is made (and get the ingredients for a Swiss cheese themed picnic later on). Many of the mountainside huts wake up for après come mid-afternoon; soak up the sunshine on one of the hundreds of loungers at the Sattelhütte, or at the Kuhbar at the Tschuggenhütte (we love their BBQ dishes!). To carry on the party into the early hours, there’s the new but already famous Kursaal with its three lively bars, comfy basement lounge and dance floor. In town, great options for supper include Lamm & Leu, with its new and sophisticated take on the classic meat grill. For good value pizza head for Grottino, where you can snap up a Margherita for around £10. After a gourmet feast at the Vetter Hotel’s Vetterstübli restaurant, pop into to their underground Strumpg Bar for their fine selection of cigars and whiskeys. There are 4.5km of sledging trails to race down; the one from Pratischli to the town is illuminated after dark so you don’t have to miss out on precious ski time. The lakes are central to the off-slope entertainment, with curling, ice-skating, and ice-hockey all ready to enjoy, and events such as the IceSnowFootball World Cup. Arosa has some of the best networks of Nordic walking and winter hiking trails in the Alps and the gradual winding footpaths alongside the pistes mean non-skiers can meet up with family and friends by the slopes. All three summit restaurants can be reached on foot, including the Hörnlihütte and the 2653m high Weisshorngipfel. If weather stops play, there’s plenty to pass the time; whether it’s a visit to the 15th Century Bergkirchli chapel or discovering local history at the Schanfigg museum. There’s always the option of a rejuvenating trip to the Tschuggen Bergoase spa – one of the best in the Swiss Alps. Experience true luxury with a sauna, steam bath and relaxation rooms fit for royalty (rumour has it Wills and Kate are among previous guests here…). 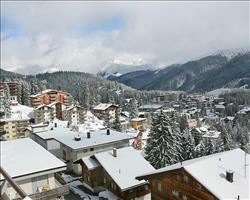 When is the best time to ski Arosa? Arosa’s slopes are mainly south to south-east facing, with an average of 8 to 12 hours of sunshine every day, which is fabulous in the depths of winter. As a resort prised for its sunny climate, it has a history of surprisingly reliable snow cover throughout the season, thanks to altitudes up to 2653m and an increasing number of snowmaking machines. 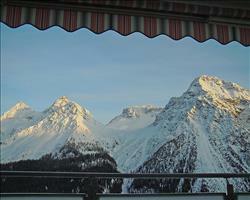 The season is usually long – with lifts known to open as early as the end of November. The deepest powder can be usually found around the Weisshorn peak, but it’s the shadier slopes of the north-east facing Hörnli that usually fare best for spring skiing when the other slopes are getting slushier. We aren’t the only to say Arosa’s great for families – it also has the tourist board’s seal of approval in the form of the‘families welcome’ label. The Arosa-Lenzerheide ski area is one of Switzerland’s best for first-time family ski trips, with over a hundred kilometres of blue runs. The Junior Club make it their mission to get everyone progressing quickly in group classes and their kindergarten, complete with magic carpet, is ideal for young skiers. For a good ski together as a family, we love the winding blue down from the Plattenhorn. It takes you all the way down into Inner-Arosa, then up the Kulm lift to Tschuggen to cruise down to Obersee through woodland on the Tomeli Talabfahrt blue. You can’t go wrong here as a more experienced family of skiers either – the red runs span the whole area and are seriously scenic. 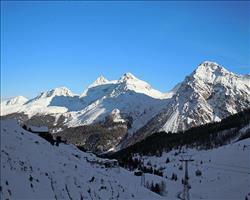 Hire a guide to tour the famously good powder – the off piste from the Carmenna pass is amazing. Off the slopes, the 900m toboggan run from Tschuggen is always good fun, or for an exciting evening treat, hurtle down the illuminated trail from Prätschli to Obersee. In bad weather, the‘Bear Cave’ is a new indoor playground for kids up to 14 and comes complete with a café so Mum and Dad can have a cuppa. For a meal out, Da Gianni welcomes families with open arms with a menu of familiar pizza and pasta dishes while Café am See and Golfhuus are also known for their great kids menus. Now in one of Switzerland’s biggest ski areas, Arosa does a stellar job at accommodating groups of all shapes and sizes. The newly linked ski area is reachable in a matter of minutes meaning there are even more peaks, runs, parks, and restaurants at hand. 111km of blue runs means beginners can really explore (ABC Snow Sports and the Swiss Ski School do group and private tuition) while high altitude reds treat intermediates to awesome sights of the Graubünden valley and the area’s legendary off piste pleases even the hardiest experts. If there are any non-skiers coming along for the ride, they’ve got lots to look forward to off the slopes. There are plenty of local walks to ramble along, on top of ice skating and curling on the local lakes. That’s if they can tear themselves away from the wellness facilities - this is an Alpine Health resort after all and you’ll find some fantastic potential for pampering at the Tschuggen Bergoase Spa. Meet up at Carmenna Hütte for a round of their notorious Munggapfupf or bag a set of loungers at Tschuggenhütte to relax in the sunshine. With so many restaurants to visit in town, you won’t find it difficult to please everyone. Try Italian at Da Gianni, Mexican at Cuculouche and Swiss at Alpenblick. We can’t stay away from Los Café-Bar – a great place to meet up and share stories of the day.